On the evening of January 29, Mayor Ko Wen-je paid a visit to Ningxia Night Market to convey his new year’s wishes and hand out red envelopes. He pointed out that Ningxia is not only the first night market in Taiwan, but will also stay number one forever as long as its vendors keep coming up with new ideas. Taipei City Government is always willing to lend its support to help the Ningxia Night Market become the benchmark for night markets all over Taiwan and beyond, and take the quality of Taiwan’s night markets to ever higher levels. Since the 2019 Chinese New Year Street Bazaar have extended to encompass Bangka Night Market this year for the very first time, the mayor decided to have a walk around Wanhua to soak up the new year’s vibes and pay a visit to nearby Ningxia Night Market to wish its vendors and patrons well in the new year ahead. Mayor Ko’s nighttime visit to the shopping and night market area of Wanhua District underscored that Bangka Night Market is part and parcel of the CNY Street Bazaar. Handing out red envelopes, he was warmly welcomed by local vendors. Within 15 minutes, his 1000 red envelopes were all snatched up. Ko told the market association and vendors that since this is the first CNY Street Bazaar to be held at their night market, there is bound to be room for improvement. He invited them to get in touch with the city’s Market Administration Office and the Office of Commerce, and promised the full support of the city government. 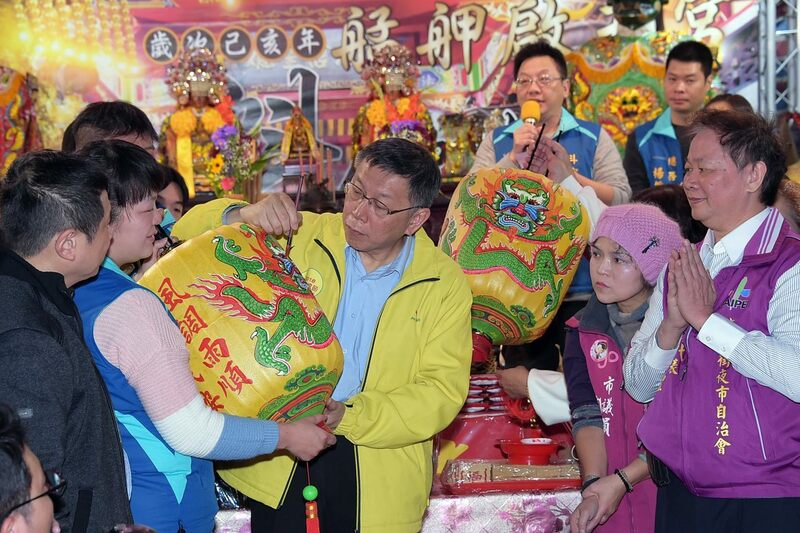 Besides the public’s all-time favorite foods, the event organizer also requested Wanhua’s Chi Tien Temple to bring out its Matsu statue to lend its blessings to the occassion. Mayor Ko duly offered joss sticks to pray for luck, protection, and brisk business for the vendors. While visiting the Ningxia shopping area, Mayor Ko pointed out that the Ningxia Night Market is arguably the benchmark for all night markets across Taiwan, as it is constantly innovating and improving itself. For instance, it was the first to introduce grease trap device, electronic payments, and a ban on disposable tableware in its constant pursuit of ever higher quality. Mayor Ko noticed that the plates, cups, and tablecloths at the Qiansuiyan Restaurant are all cultural and creative products -- so the Ningxia Night Market was not only the first, but will always remain the first if it carries on this way. He expressed the hope that everyone there would continue their excellent work, adding that for the Taipei City Government “there is no best, there’s only better,” meaning there is always room for yet further improvement. As long as the Ningxia Night Market keeps coming up with new ideas, the Taipei City Government is willing to lend its support. Mayor Ko expressed his wish for Ningxia Night Market to become the standard of Taipei’s night markets and then for all of Taiwan. If everyone works together, the quality of Taiwan's night market can only become better and better. After these words, Mayor Ko posed for a selfie with two students from National Yunlin University of Science and Technology who had designed the tableware for the Qiansuiyan Restaurant. Finally, he drew out the lucky ticket for the main prize: a 43” TV set.